Join leading experts and practitioners on April 5th for “The Future of Big Data: Artificial Intelligence and Machine Learning” - 6th Annual New Jersey Big Data Alliance Symposium at New Jersey City University. Explore the impact and potential of Artificial Intelligence and Machine Learning in transforming business operations and driving new innovations; gain insights on cutting-edge research at New Jersey’s premier academic institutions; participate in relevant and valuable workshops; and network with industry, government, students, academic leaders and New Jersey Big Data Alliance members. IEEE Big Data Podcasts - We bring the specialists to you! Through our Q&A podcast series, IEEE Future Directions interviews some of the top subject matter experts in the big data field. Covering everything from privacy and security to biomedical and analytics, IEEE Big Data Podcasts provide you with access to the industry's best of the best. Nowadays, we are facing explosive data growth. These data come from diverse sources, including business, entertainment, education, healthcare and science, and can be highly dimensional, heterogeneous, complex, unstructured and unpredictable. The challenges in analyzing “big data” call for fundamental techniques and technologies. At the same time, the big data analysis has created new opportunities for industries and academia. Computational intelligence (CI) enables agents (or decision makers), for example, the computers and the smart devices, to process and analyze the captured data computationally, and subsequently to identify and explain the underlying patterns of the data, as well as to efficiently learn the specific tasks. CI covers a broad range of nature-inspired, multidisciplinary and computational methodologies, such as fuzzy logic, artificial neural networks, evolutionary computing, learning theory, probabilistic methods, and so on. CI technologies are expected to provide efficient and powerful tools that scale well with data volume for big data analytics and process, while addressing the challenges brought by the massive amount of data. Big data science is the study on collecting, storing, aggregating, governing, archiving, analysing and other ways of manipulating massive volume of data with very high dimensions constantly being generated by many different systems, devices and applications, to solve complex problems analytically. It provides a new opportunity in fighting cyber attacks which are the deliberate attempts from unauthorized parties to access information and communication systems in unlawful means with the goal of theft, disruption and damage. With the help of big data technology, it is expected that the majority of cyber threats can be predicted, detected, responded and prevented at machine speed. This SIG focuses on big data analytics and analysis in the field of cyber security, which uses advanced data analysis techniques to uncover hidden patterns and unknown correlations in cyber attacks such as malware and spam emails from large and varied data streams that are continuously collected from information and communication systems. Due to the 5Vs of big data (Volume, Velocity, Variety, Veracity, and Value), this SIG is particularly interested in further developments and applications of knowledge discovery, data mining and machine learning algorithms of clustering, classification, prediction, diagnosis, optimisation, and association in dealing with cyber security threats of malware/ransomware, compromised devices, zero-day attacks, and other malicious insiders. The algorithms are typically implemented using mathematical and nature-inspired approaches such as Bayesian networks, artificial neural networks, annealing, deep learning, Bayesian networks, Genetic algorithms, Dempster Shafer’s theory, fuzzy logic, Mont Carlo, parameter estimation, recommendation engines, similarity matching, amongst others, which are all within the range of this SIG. The democratization of data is transforming our world. Sensors are everywhere. Cities are measuring and acting upon a wide variety of data sources. Governments at all levels are opening their data to their citizens. Old businesses are being transformed by data. Dynamic new businesses are powered by data. Anyone with a smart phone now carries with them a sensor platform generating data. In response, workforce needs have shifted rapidly. Demand for a new breed of professionals skilled in data, analytics, machine learning, and artificial intelligence requires a requisite response from both higher education and workforce development. To help guide workforce development programs, IBM and Business-Higher Education Forum partnered with Burning Glass to develop a deep understanding of current job market demand shifts. The world is changing around us—and fast. Business leaders feel more pressure than ever to innovate and they’re urgently searching for the people who can help their organizations adapt with agility and speed. At the same time, increasing portions of the workforce face skill obsolescence, reduced earning potential, and workplaces that demand more sophisticated technology and data analytics skills than ever before. How can we best prepare students and the broader workforce for the opportunities and challenges that lie ahead? Health information technologies are revolutionizing and streamlining healthcare and their uptake is rising dramatically. The variety and range of systems and applications is considerable and there is increasing demand for implementation of healthcare IT in hospitals, clinics, homes and in the virtual space of mHealth, pervasive healthcare and social media. However, to effectively implement these technologies scientific, research, industrial and governmental supports must be strongly in place in order to transform healthcare and build capacity at the regional, national and global levels. The conference will take a multi-perspective view about what is needed in order to move technology along to real sustained and widespread use. Solutions range from improvements in usability and training, to need for new and improved design of information systems, user interfaces and interoperable solutions, to governmental policy, mandates, initiatives and need for regulation. In addition, greater interaction will be needed among industrial, governmental and academic partners. This conference is presented by the School of Health Information Science. 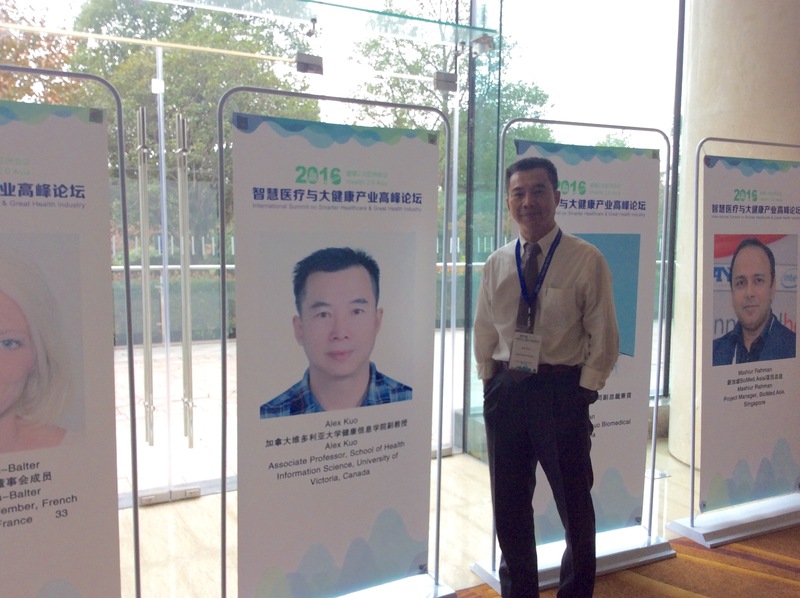 Health 2.0 Asia 2016 International Summit on Smarter Healthcare & Great Health Industry (see http://www.bitcongress.com/health2016/) was held in Nanjing, China for 2 full days (November 9-10, 2016) of content exploring smarter healthcare & great health industry. The conference brought together industry leaders, stakeholders and innovators from all over the world in an effort to support the rapidly-expanding healthcare market. The event was the platform to see cutting-edge innovation that’s currently transforming health and health care, plus the best minds sharing their insights on compelling panel discussions, keynotes, breakout sessions, and workshops. View the conference site for more information. Gartner Webinar: What Is True? What Is Real? And Does It Matter In a Data-Driven World? How to deal better with the unpredictability of "reality"
We are obsessed with data-driven business. Is that really, truly desirable? Is "data" truly, really objective, or is it just perception? In rational decision making, how's "logic" doing, anyway? How should you deal with reality's habit of biting back? The Art of Influencing: How CDOs Should Engage Their Stakeholders Discussion Topics: How to frame business problems to focus on tangible outcomes How to connect with business stakeholders in a way that makes analytics actionable How to identify causal relationships between data assets and business value Many data strategies and analytics initiatives still focus on the implementation of technology and fail to deliver tangible business benefits. CDOs must change the conversation with their business stakeholders to influence the cultural change impacts of a data-driven approach and ensure that the business value of information assets is fully realized. Continuum Analytics' data scientists and engineers have developed a new Big Data visualization approach called datashading. Join us for a webinar on Big Data visualization with the new datashader library, led by Continuum Analytics CTO Peter Wang and Solution Architect Dr. Jim Bednar. Visit Continuum Analytics for more information and to register! Simplicity, accuracy, speed; these are three things everyone wants from their data architecture. MaxCDN, a content delivery network based in LA, was looking to achieve these goals and developed a framework that handled batch and stream processing with open source software. The objective was to manage the real-time aggregation of over 32 TB of daily web server log data. Data is moving at blinding speeds, generated by a wide range of sources – from mobile phones and sensors to a variety of connected “smart” devices. This data, most valuable the moment it arrives, will continue to increase in both volume and variety. Employing a solution that handles streaming data, provides state, ensures durability, and supports transactions and real-time decisions is key to benefitting from fast data. But don’t take our word for it. During this webinar, Ryan Betts will address five data management pain points VoltDB solves by highlighting real customers with real, in-production solutions. The data you need to manage isn’t getting smaller, or slower. It’s a snowball, compounding in both speed and volume. If you’re building applications on fast, streaming data, you need to analyze it, gain insight and take action on it now, not at the end of a batch job. Fast data is streaming data or data in motion – and it creates Big Data. Forrester analyst Mike Gualtieri thinks the perishable insights in fast data “can have exponentially more value than after-the-fact traditional historical analytics.” So how to tap it and why would you use the same infrastructure to handle fast data the way you handle big data? What does work? An in-memory database that supports actions and streaming analytics in real-time without sacrificing transactional integrity, performance, and scale. Technological advances and market opportunity are reinforcing the demand for applications that can produce real time insight from streaming data and then act on it. New streaming analytics and in-memory database technologies enable applications to use stream-processed data instantly, while relying on a fast operational database to support transactions, to make decisions, and to take action. Applications with this capability know what's in ‘live’ streams of data, and analyze and act on them faster than anyone else. See the proof with sample use case presentations from mobile, financial services, gaming and ad tech. Sign up today to learn how VoltDB is built to handle the rapidly shifting needs of developers and businesses, supporting apps that rely on ingesting, analyzing and transacting on live streams of data in real time. Today more than ever, managing data can be like drinking from a firehose. If you’re building applications on fast, streaming data, you want value from your data now, not at the end of a batch job. You need to transform raw information from sources like, social, mobile, cloud, devices and M2M into actionable data, all in the blink of an eye. The key to getting value from big data is in processing it for insights and improved decision making. This webinar explores how different vertical industries are using big data, the types of data they are leveraging, and the challenges they face. Register for this webinar now to learn about a better, smarter approach to data security in the Cloud. This is the first in a series of three tutorials on big data created by Mark Davis and the IEEE Cloud Computing Initiative. In this introduction to big data, you will understand the why's, what's, how's of big data, where it's going, and some of the key concepts of big data. Mark Davis is a Distinguished Engineer at Dell following the acquisition of his big data analytics company, Kitenga. Mark founded Kitenga and served as CTO prior to the acquisition, designing and building the core Hadoop-based engine for the enrichment and analysis of unstructured data. The New Jersey Big Data Alliance (NJBDA) was established by the Rutgers Office of Research and Economic Development and the Rutgers Discovery Informatics Institute to catalyze the collaboration among New Jersey government, academia and industry that will enable all parties to address the significant and immediate challenges posed by the proliferation of data sources and the resultant deluge of digital data in a strategic and coordinated manner. This unprecedented alliance brings together universities and colleges from across the state, and has the overarching goals of identifying common challenges and areas of synergy, developing joint programs, and ultimately nucleating an effective alliance that will increase our research competitiveness and drive economic development in New Jersey.